Development of new plum varieties has lagged behind that of apples and cherries, but Avalon is an excellent example of how plum breeders are starting to improve on the traditional English Victoria plum. The flavour for eating fresh is far superior to Victoria, and although cropping is not quite as heavy as Victoria it is still a respectable cropper. The flesh is firm and sweet with some tanginess. The stone separates fairly cleanly from the flesh. Avalon is also an excellent culinary plum - Avalon plum jam has a deep blue/purple hue with a strong sweet flavour. The plums can be picked slightly underripe for use in puddings, when they are a pale red colour, or wait until they are darker red and fully ripe for eating fresh. Please fill in the details below and we will let you know when Avalon plum trees are back in stock. The definitive English plum, better for cooking with than Avalon, but not quite as good for eating fresh. Avalon is in flowering group 2. Avalon is partially self-fertile, but fruiting will be improved if there is a compatible tree of a different variety nearby. Avalon produces a strong-growing tree, generally healthy and not requiring much attention. It is partially self-fertile but benefits from another compatible plum tree nearby. Avalon flowers quite early, so make sure you are not planting in an area prone to late frosts. Disease-resistance appears to be generally good. Avalon was developed by R. Jones at East Malling Research, in Kent, and released in 1989. It is a seedling of Reeves, an old and well-regarded English plum variety. 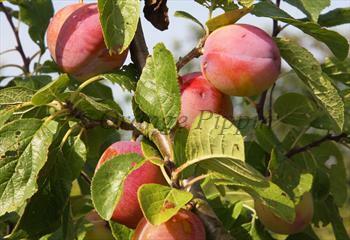 The same breeding programme also led to another useful plum variety called Excalibur which was released at the same time.